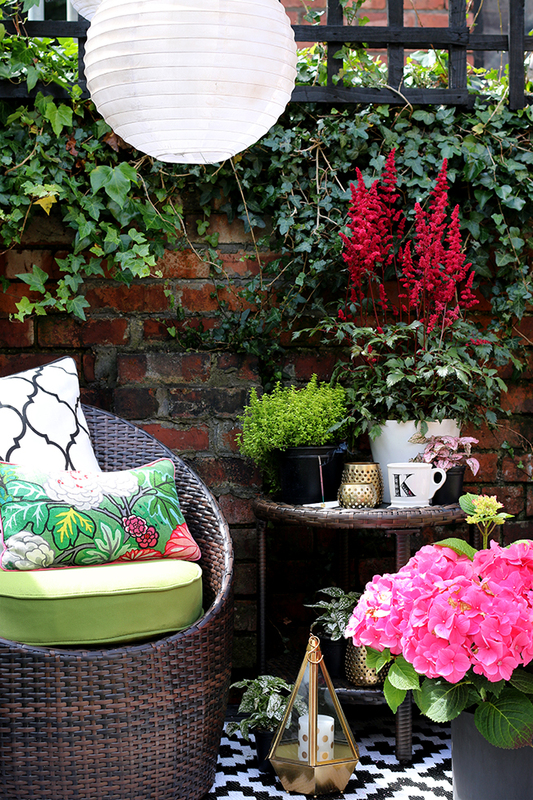 The REVEAL of My Back Garden Patio Makeover! 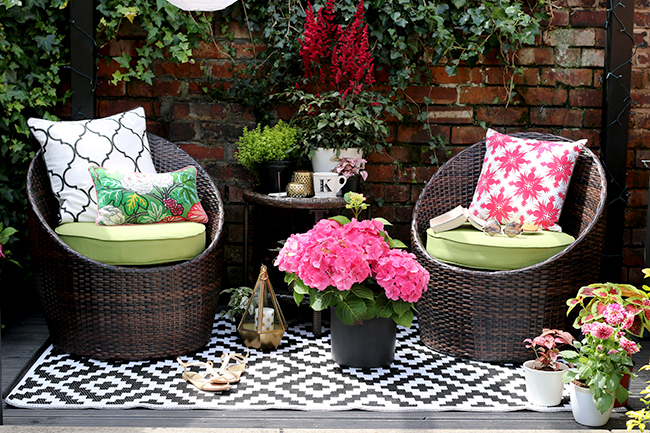 It’s the patio reveal day!! These are my VERY FAVOURITE POSTS TO DO. Honestly, I wish I could do them every week but alas, I would need a much bigger house and a heck of a lot more money. 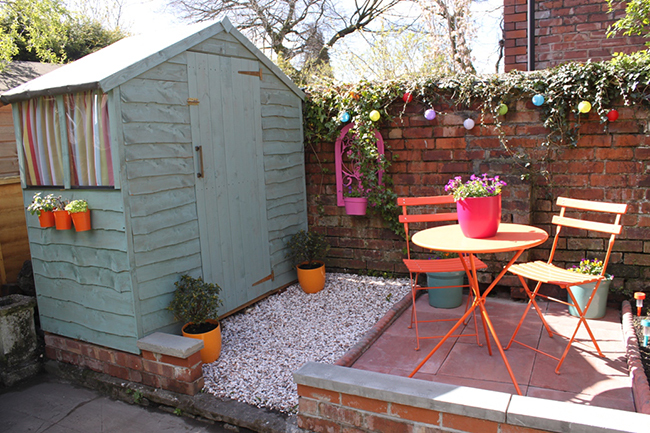 But today the little spot in the back of our garden is ready for it’s big debut. Are you ready? Of course you are but we’re not going to just jump right in. Consider that the appetiser. I know I know I’m cruel and don’t think I don’t know that you’re just going to scroll down because of course you will (because I would too). But I really think it’s worth talking about what we started with and why we did all this first. *This post contains a few affiliate links which are indicated by an asterisk (*). 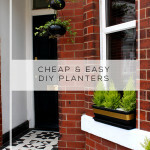 If you click on the link, you don’t pay any more but I may earn a few extra pennies for pretties for the garden. Win-win! You can see my affiliate disclosure in the sidebar for more information. 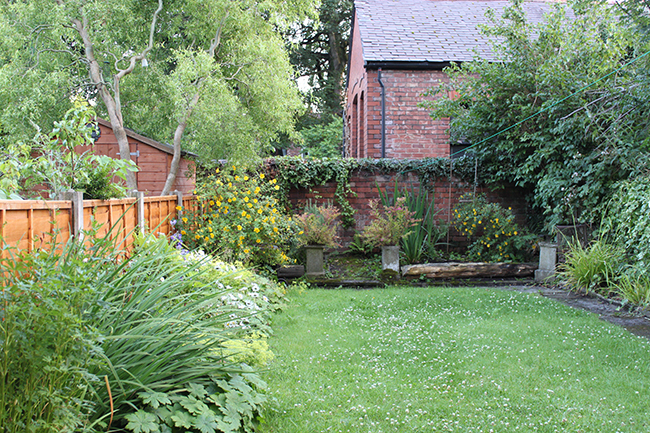 Long long ago when we first moved in, this little patch at the back of our garden was a horrible mess. This was taken in June 2011 so a year after we’d moved in. We’d replaced the fencing on one of the borders but there was just nothing but a lot of overgrown bushes and dead leaves back there. No man’s land. 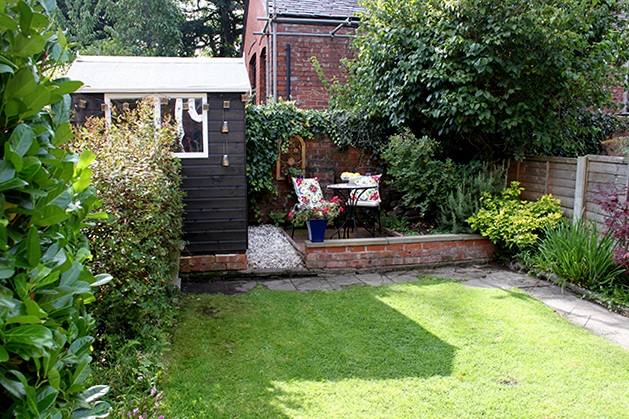 The following summer, we decided to do some major clearing and created a teeny tiny little patio with a teeny tiny little shed. This actually is one of my most popular pins on Pinterest. Crazy. But it was really cute, I admit. We also did a lot of planting along the borders to create some year round greenery. And then last year, we decided our teeny tiny shed just wasn’t big enough so we put a bigger one in and I decided to make it a bit more of a grown up space. I admit however, that because of the size of the patio and because it’s quite overlooked by our neighbours, we rarely used it. We live on a typical Edwardian/Victorian style street where the houses are quite close together. While we had planted some larger bushes when we first moved in that had grown to provide a good privacy screen over on the left side, the right side still had low fencing and our plants hadn’t yet matured enough to provide cover on the right. So yeah, it looked fine but it wasn’t an ideal place to hang out. That brings us to this year when our neighbours were working on their back garden, removed part of a tree which then fell on another tree and into our back garden. Whoops. What happened sadly was that those lovely big trees had to be removed (which gracefully blocked a large part of the view of that f*&$”£! scaffolding which has been there for 2 1/2 years) and we were left with a really open and very overlooked patio. It was pretty bad. You read about that here. So we decided to take action. Wayne erected a pergola, replaced the short fence panels with nice tall ones and I painted and decorated! So here we are today. 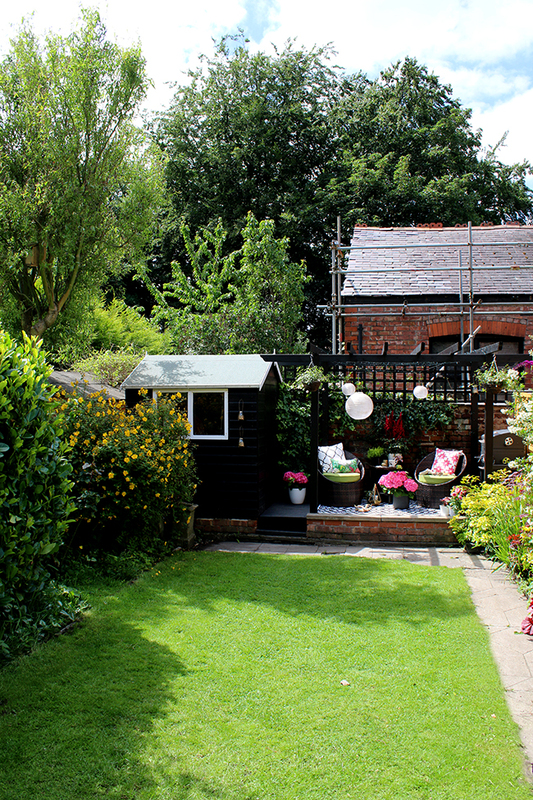 First, I have to say the garden finally – after 6 years!! – feels like a private oasis full of lush greenery. I can go into the space without feeling like my neighbours in their gardens can see everything I’m doing. We have really nice neighbours (thankfully) but the back of the garden always felt a bit like a communal space because everyone was able to see straight into everyone else’s yard due to that low fencing and I was so happy our neighbours on the left agreed they liked the idea of bigger panels too! I mean, it’s nice to chat and everything, don’t get me wrong, but we just wanted to feel the space was our own, ya know? 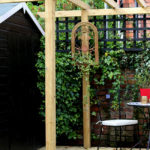 And with the addition of the pergola, when you are sat on that little patio, it truly feels private because you have something over your head! You can’t see into anyone else’s garden and you can only see the very top windows of the houses on either side. In terms of being overlooked on a street with lots of houses crammed next to each other, it’s pretty awesome. Now let’s talk about some of the design elements! I painted the entire thing black because I wanted it to feel like it was connected in some way with the shed. 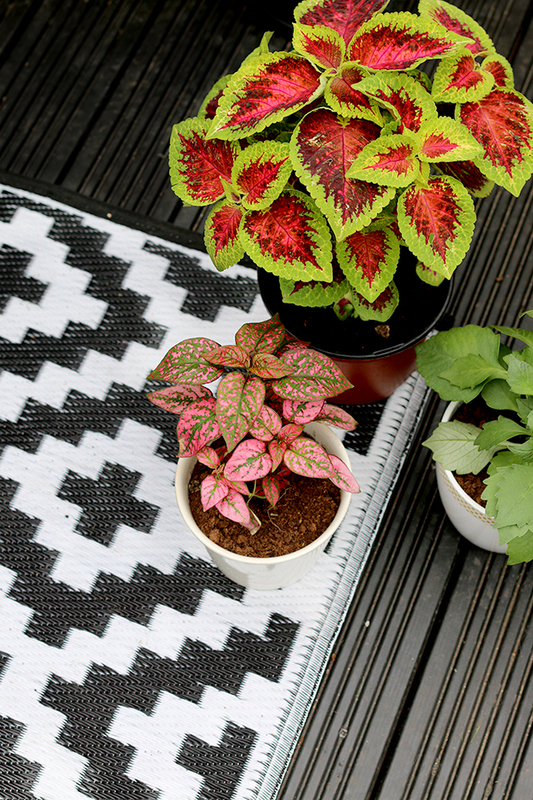 Plus, I am seriously digging black in garden design right now (in fact, I did a post over on Oak Furnitureland’s blog recently all about it) and we are going to be painting the decking directly in front of the house in the same colour. 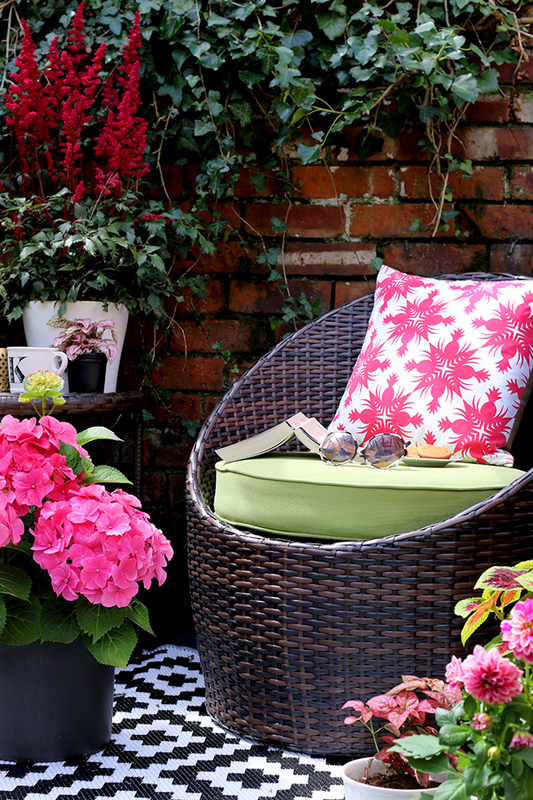 I decided to stick to a more neutral colour scheme of black, white and green and then just added punches of pink in the plants and flowers and tied those in with some throw cushions. This way, I can change the colour scheme in the future without having to buy lots of new things – just new plants ;) The cushions from left to right are from Elce Stockholm, Stuck on Hue and Bianca Hall in case you were wondering. I looked long and hard for a new seating set for the space. We certainly have more space back there now which was fantastic but it wasn’t large enough for a sofa set or anything like that which I would have loved. And garden furniture is EXPENSIVE – holy crap. It’s really expensive. So for the sake of a tiny budget (I’m doing up my kitchen, remember?) and because I really wanted a set that we could settle down into, I decided on this little round set from George at Asda (!!). I have to admit, I kind of love it. The quality is great and for less than £130 we have some really comfy seating with nice thick cushions. I also filled the space with lots of plants – something that I always wanted to do to add back in some of the greenery we lost with the removal of the large trees that used to overhang this space. Thankfully, we have some fantastic ivy that we want to train to cover the top of the pergola in time and we’re looking at also getting some climbers as well. 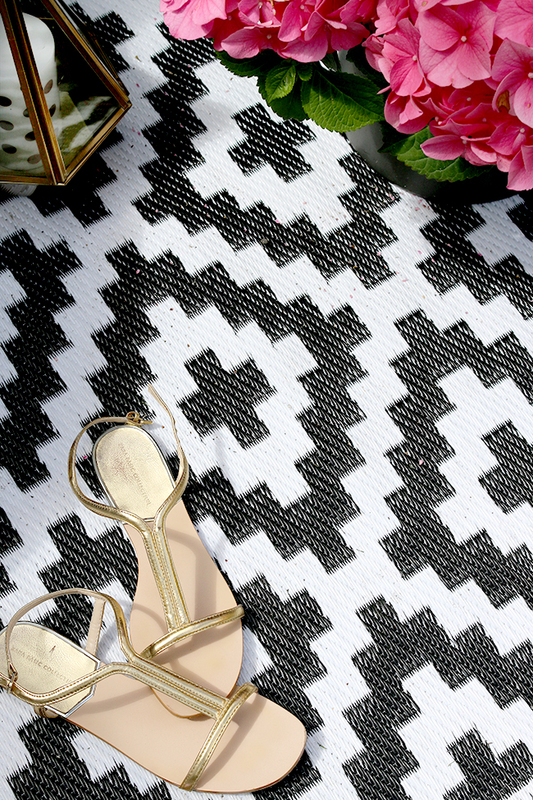 I added the graphic black and white outdoor rug* to give the whole space a bit more impact. I ended up buying two more rugs for the decking in front of the house to tie it all together as well as a patio umbrella in the same green colour but there’s still some work to do there so I’ll have to share that at a later time! And lastly, I wrapped little solar fairy lights around the entire thing and added a few hanging Chinese lanterns* so at night, this spot is lit up like a Christmas tree and I LOVE IT. 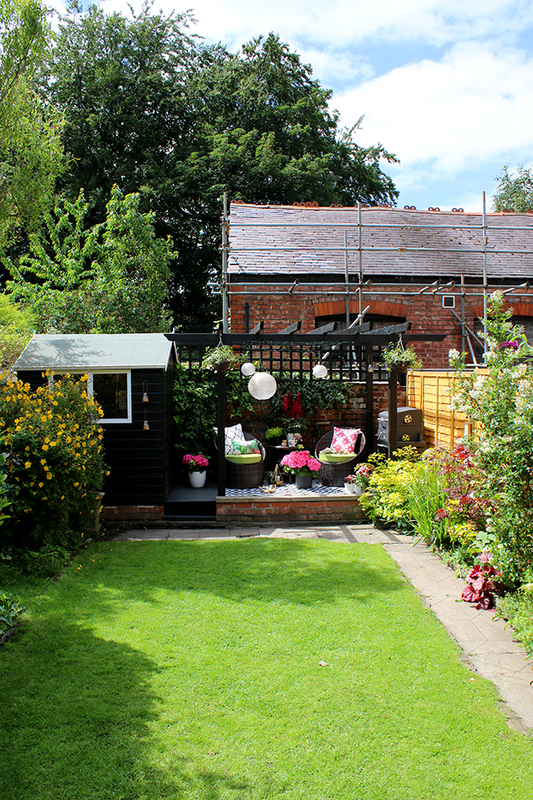 I have to say that it’s taken us 6 years to get to this point with our garden and despite that horrible scaffolding that we can do nothing about, it’s probably the best the garden has ever looked. Our ‘Garden on a Roll’ which we put in 3 years ago is finally properly maturing now and is still going strong, we have nice coverage on the other side too thanks to the Laurel that Wayne planted nearly 5 years ago. 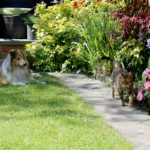 The lawn had been destroyed when Quito was a puppy (he loved to dig and to pull tufts of grass out of the garden with his mouth – in fact, he still likes doing this but he’s finally starting to understand that the humans don’t like when he does it!). Wayne planted grass seed and has nurtured it back to life this year and while it’s not 100%, it’s probably at about 95% back to what it used to be – nice and lush and green. The biggest impact in terms of privacy has been the higher fencing – something that’s hard to put across in photographs I admit because you’d really have to stand in the space to understand how little we used to have in this spot. 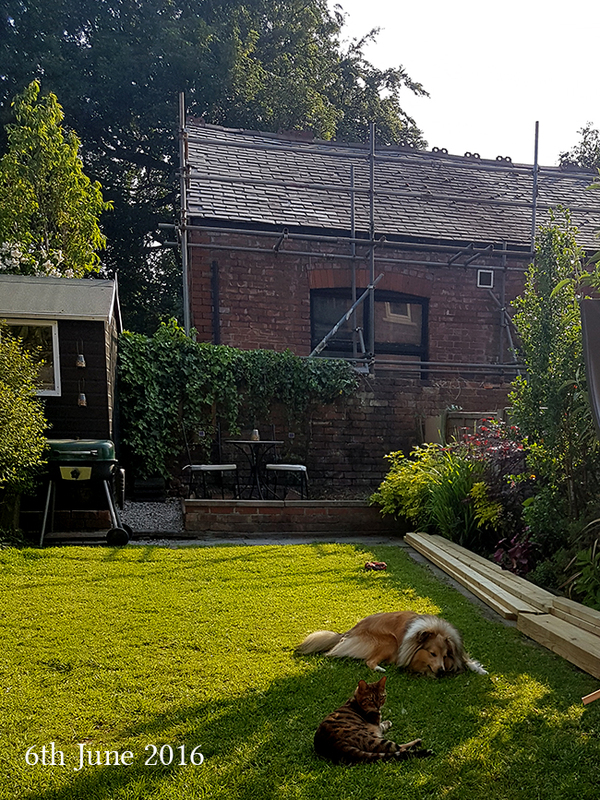 But it truly feels like it’s our own little oasis now and our new pergola and patio have given us the freedom to enjoy the whole of our garden now, not just parts of it. We’ve already spent lots of time in this spot and as this week is supposed to be a scorcher, I have no doubt if you’re looking for us, we’ll be in this little spot at the back of the garden enjoying a cold drink or two. So that’s the reveal for today! I’d love to hear what you think of our new little patio? 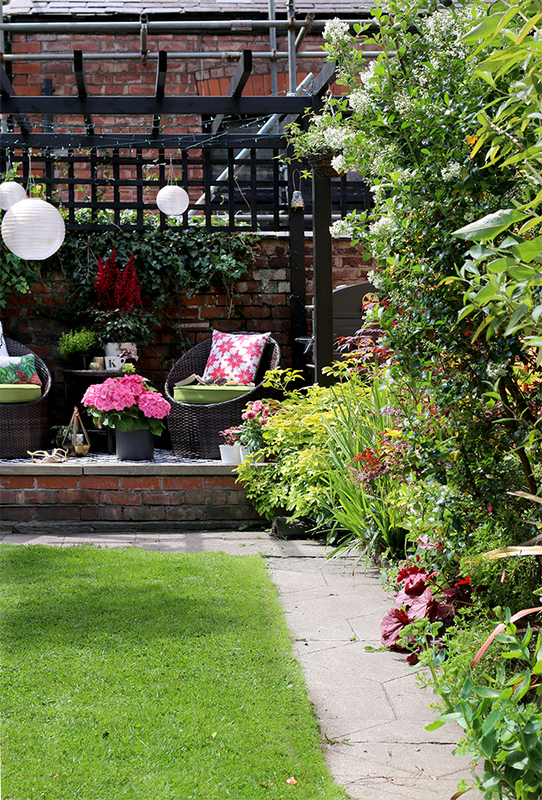 Do you suffer with privacy issues in your garden as well and if so, what have you done to cope with it? Getting the Garden Summer Ready! Love the final result! 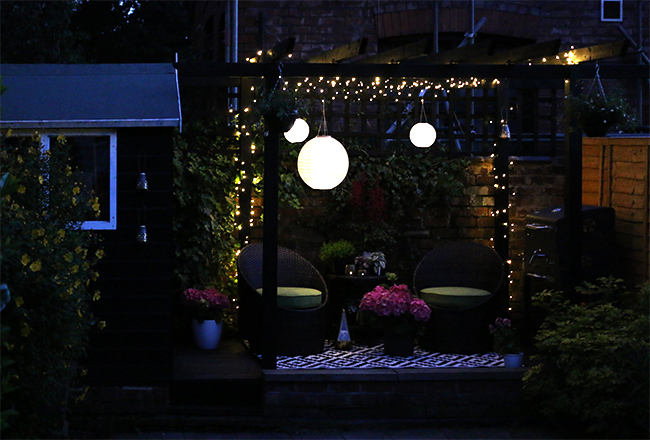 The pergola was such a great idea and it looks magical when it’s all lit up at night. We’ve got a very small end terraced house yard which we’re trying to make a little more private and cosy at the moment. First step is getting a bit more height on the brick walls with some fencing and then we’re looking to get some faux grass in there too. Then I’ll be heading straight back here to get some decor inspiration! I love your chairs, they look really cute & cosy. Looks great, a wisteria would look glamorous trained on the pergola …. This looks great! I love the black painted wood. We’re also working on our garden so you’ve given me inspiration and motivation :) I’d like a pergola too with some lovely climbers. Your fairy lights and lanterns look so pretty. Gorgeous! It truly feels like an oasis. Love the fairylights. This is so beautiful Kimberly! You’ve done an amazing job! How amazing is that garden on a roll too? 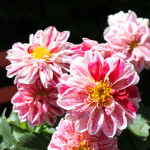 It’s really given you a gorgeous varied border – especially now it’s fully established. When (if!) we ever move, I’m going to give that a go. In fact, I’ll be copying loads of your garden!!! 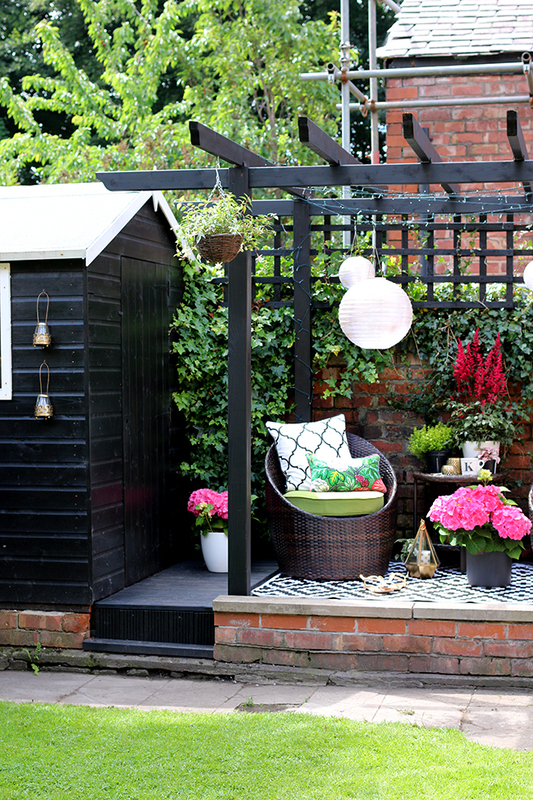 How gorgeous is that black pergola and shed and the furniture, cushions, rug, beautiful plants and flowers… it all looks amazing – it must be so nice to sit back there! I love it! I know exactly what you mean about the privacy. 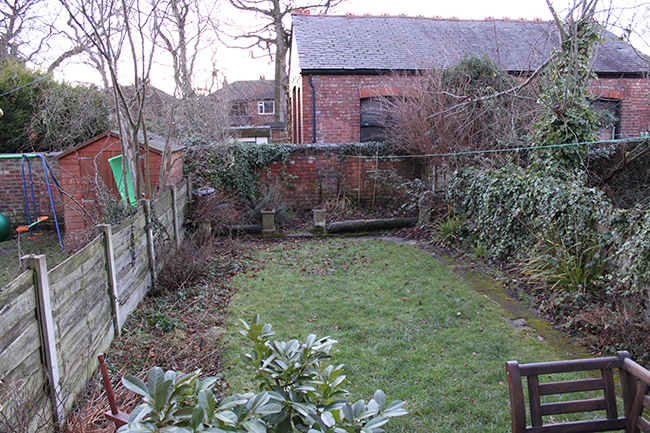 I’ve got a massive garden, but on both sides it’s bordered with a very low wire fence – so there is no privacy at all! Well, there is a proper fence and garage wall near the house – so there is a very small section of privacy then it all just opens up completely. When I bought the house I thought I’d get big fences whacked straight up all the way down – but there were other priorities inside the house. Then after a while when I’d got to know and chat to the neighbours it always felt a bit rude to suddenly fence it all! But I can really imagine the difference it’s made for you to put the high fence up at the back so that is a proper private spot. 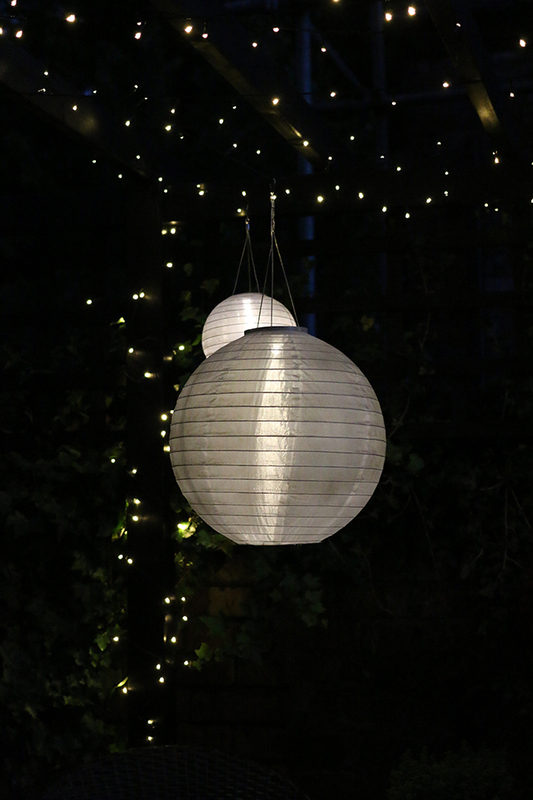 Oh, I love the fairy lights and lanterns so much too – how pretty and magical! And solar – so easy!! I have to get me some of them! Love it! You did a gorgeous job, both in building it out and decorating. Makes me want to come sit a spell and have one of those cold drinks with you ;) And at night, well lets just say it look awfully romantic! Another beautiful space you designed there Kimberly! It looks lovely! I love the black and white rug and the pops of pink. We really need to buy a table and chairs and I’m hoping to get metal ones with black and white cushions. I’m loving black and white, I think it’s so chic! I gasped at the night photo with all the twinkly lights! Magical! 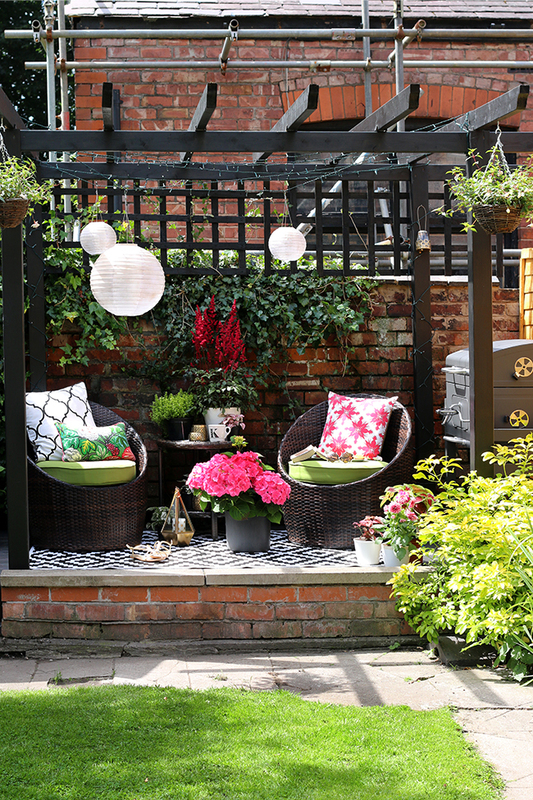 Looking at what this back patio space used to be, you should be soooo pleased with what you’ve turned it into! Stylish, inviting, joyful and absolutely wonderful. Let’s hope for some good weather over the summer months! Omg!!! Everything looks soooooo good Kim! Love it all so much. The furniture is fab and I adore the rug. 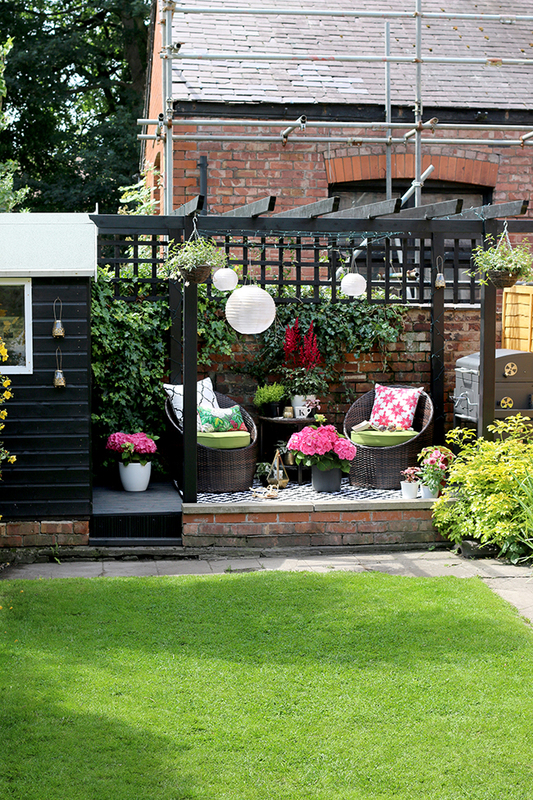 This little space is just fabulous.